Valerie Karplus SM ’08, PhD ’11 examines energy systems through a variety of lenses. This is, perhaps, unsurprising given her background: She holds undergraduate degrees in biophysics and political science, and graduate degrees in civil and environmental engineering, and in technology, management, and policy. Now, Karplus, the Class of 1943 Career Development Assistant Professor at the MIT Sloan School of Management, has seized an opportunity to incorporate her portfolio of perspectives into a single new class: Global Energy: Politics, Markets, and Policy. Launched in spring 2018, the class is cross-listed in Economics, Management, Political Science, and Urban Studies and Planning. The class investigates energy technologies, markets, and governance, employing methods from economics, political science, and sociology to understand past transitions and prospects for a cleaner energy future. Open to both graduate and undergraduate students, it is offered as a social science pillar of the Energy Studies Minor. 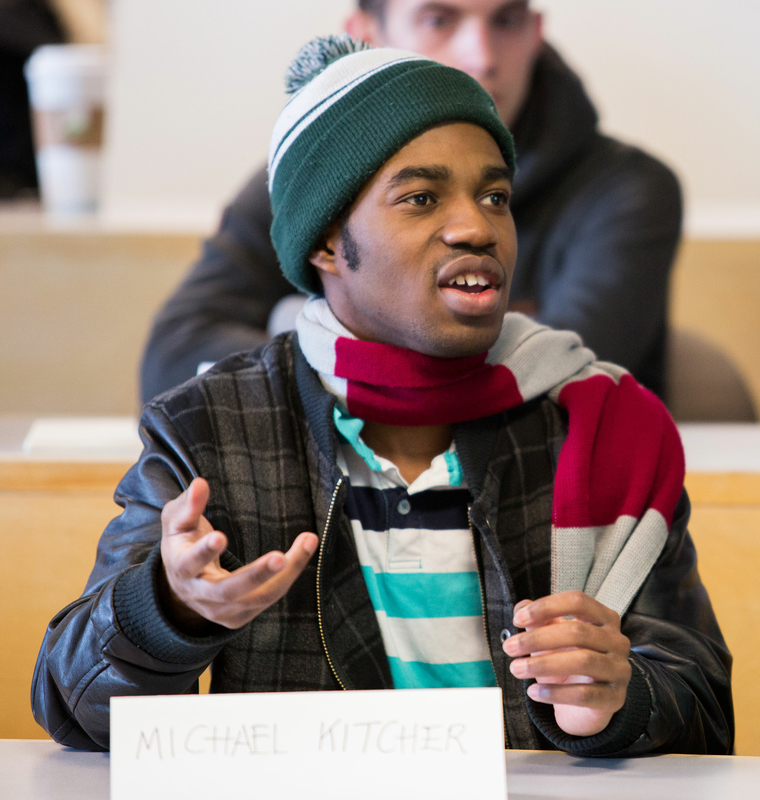 Michael Kitcher ’18, a materials science and engineering major and energy studies and applied international studies minor, finds this approach appealing. “It’s important even if you find a good technical solution to be cognizant of problems you might face in the country you’re working in, and to understand how your solution fits in,” he says. Kitcher, who grew up in Ghana, hopes someday to develop sustainable energy technologies for developing countries. “I was excited about taking Global Energy because it goes into cultural and societal factors behind energy policies, which is something I hadn’t seen offered elsewhere and relates to the research I want to do,” says Max Aidas Vilgalys, a doctoral candidate in social and engineering systems. With an electrical engineering degree from Stanford University, Vilgalys hopes to use technology to encourage individual behaviors that align with lower carbon usage. The class, funded by an S.D. Bechtel, Jr. Foundation grant, was several years in the making. Karplus, who had just joined the faculty at MIT Sloan, was engaged in research supported by the MIT Energy Initiative investigating how China designed and implemented energy and climate policies. 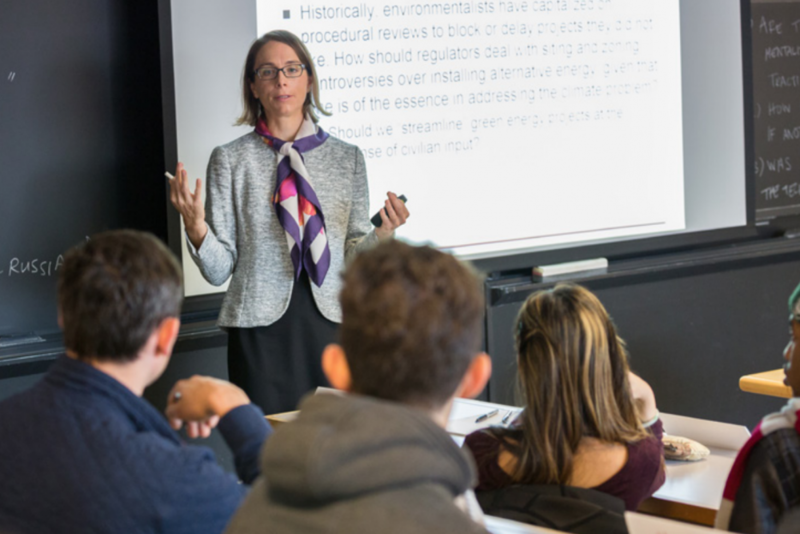 She was eager to teach a class that tapped into her area of expertise: integrated analysis of how technologies, economics, and politics affect energy system performance, tying in ground-level experience as well as top-level policy perspectives. She also wanted to identify a unique niche in both the MIT and energy studies curriculum. With political scientist Christopher Warshaw, who has since left MIT for George Washington University, Karplus began to design a class with an interdisciplinary focus on energy development and decision-making by governments and by the private sector. She sought to connect theory and practice through interactive class exercises, such as classroom visits by practitioners and the Climate Interactive “World Climate” negotiation simulation, which confront students with real-world problems and ask them to think through solutions. “I wanted to make potentially distant global energy issues really come alive for students,” says Karplus. Homework assignments place students in roles where they must identify governance structures shaping a country’s energy flows, provide guidance on policy decisions, and evaluate business decisions to invest in clean energy. One such assignment asks students to write a memo for India’s environmental ministry arguing for or against a carbon tax as the primary instrument for achieving the nation’s pledged level of carbon dioxide emissions. Another asks students to justify locating a new solar photovoltaic construction company in a particular city and country. Graduate students must fulfill more of these assignments than undergraduates. Multidisciplinary analysis is one way to encourage a complex view of energy problems. Another way is to bring together students from different majors and different stages of their education. Among the 19 undergraduates (including seven energy studies minors) and nine graduate students enrolled in the inaugural Global Energy class are students concentrating in physics, math, economics, architecture, materials science, management, and urban studies. Undergraduates and graduate students team up for a final project: reporting on the prospects for an energy technology, policy, or practice in a particular market, wielding approaches from the social sciences. In 2017, the Bechtel curriculum development grant supported a team that contributed to developing background material and reading summaries for the class. Two Undergraduate Research Opportunities Program students from Wellesley College, seniors Shaina Ma and Zarina Patwa, worked with Karplus and Melissa Webster MBA ’09, now a lecturer at MIT Sloan, to assemble class material and summarize readings and lecture content as well as test in-class simulations. Bechtel funds also supported Arun Singh SM ’17 and PhD candidate Michael Davidson of the Institute for Data, Systems, and Society to attend global climate talks, generating firsthand observations shared with students during a negotiation exercise using the World Climate simulation developed by Climate Interactive. Early on, former MIT political science professor Christopher Warshaw and graduate student Parrish Bergquist of urban studies and planning also worked to develop materials on the political economy of energy in the United States, which have been incorporated into the first offering. The Global Energy class will be offered again in spring 2019.